Yes, the dress that seems to be ‘everywhere’, Vogue 9253. I make no apologies for succumbing to the pattern ‘fad’, I loved it on its release and purchased it as soon as it was in-store in Australia… which seems to take much less time than it used to. I got home from hospital and decided I needed something lovely in my life to focus on… so sewing it was. There is no time for self misery when you surround yourself with beautiful things and people. I pulled this fabric put of my stash and immediately pictured this dress. Vogue 9253 – much more ladylike but alas a droopy hat. I’ve struggled in 2017 with trying to sew sensible things, things for my lifestyle and whatnot… but in all honesty I enjoy sewing when inspiration takes me by surprise. Right now, I have the urge to sew all.the.pretty.dresses so I think I might just indulge myself. Welcome back mojo. 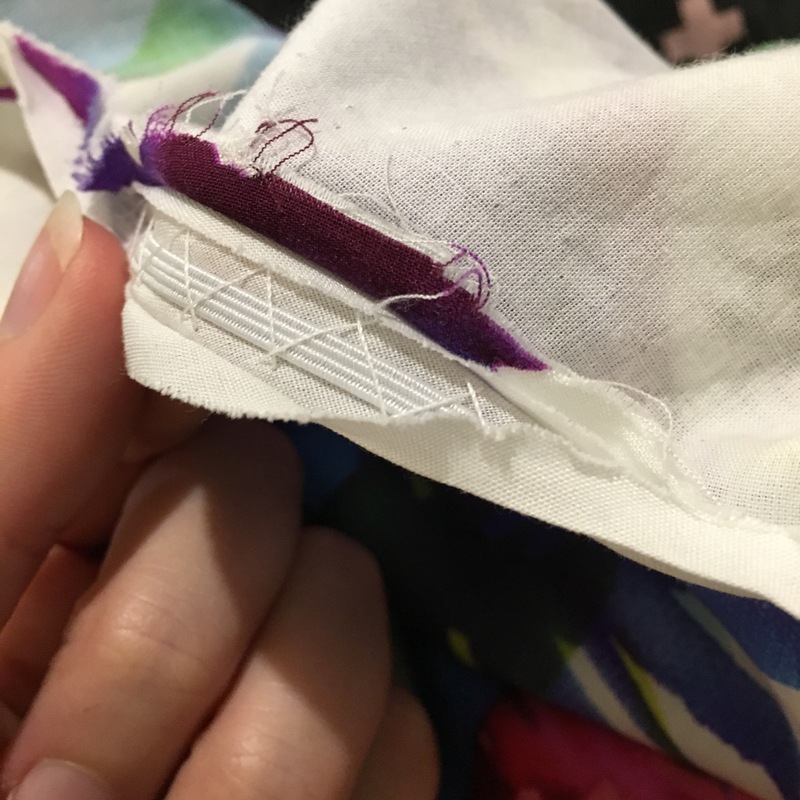 I sewed up the front bodice pieces in the centre by 2 inches (10 centimetres) and turned narrow hems under along the raw edges. And then sewn these down to the bodice. The stitching lines continue down the skirt front and its front split opening. Vogue 5253 – inner bodice finish. I sewed the front seam up 10cm. I also only partially sewed the centre seam of the front skirt pieces. I find it easier to walk in maxi skirts that have a split, preferably in the front. This enables my legs to break free of the fabric, rather than the fabric wrapping around and slipping between my legs when I’m walking or there is a breeze to contend with. I finished the seams in the same manner as the bodice centre front seam. I decided to not put in pockets as I felt the light fabric didn’t really suit pockets and they might interfere with the fluid drape of the skirt. I french seamed the skirt side seams and narrow hemmed the skirt centre back seam edges for a neat finish. I added strips of interfacing along the centre back seams to stabilise the fabric for the invisible zipper. I shortened the skirt pieces by 3 inches. I’m 5 foot 4. This fabric actually has a massive fabric repeat which I didn’t notice when I purchased it. It appealed to me due to the carefree large-scale print which seemed to have no rhyme or reason to it. 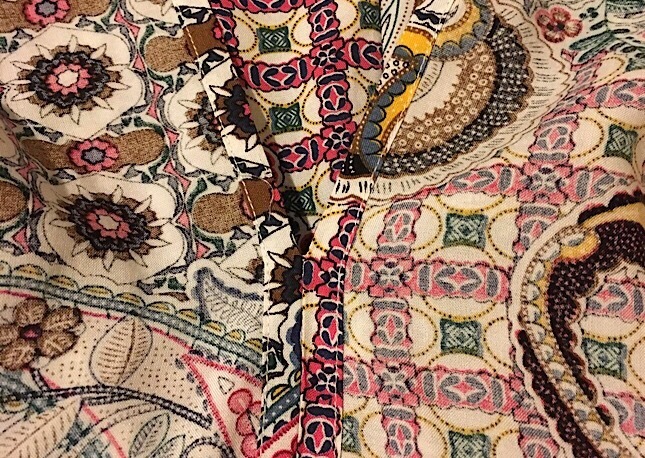 I deliberately chose not to pattern match (shock, horror) as I prefer the carefree feel the fabric print, deliberately placing motifs just felt too structured for the relaxed feel I envisaged this dress/fabric match delivering. The tie droops at the front. I think I may hand stitch this to the bodice seam, at least in part. Even with my minor grumble, I have lots of love for this dress and pattern. I do think sewing up the front bodice a little makes it much more wearable for day-to-day use. I sewed this very slowly. I’m learning to ‘slow down’. I was still very tired from my week in hospital so I sat at my kitchen table as I created this, hand basted my pleats and darts, hand basted hems in place before machining. Yes, probably more fastidious than required… but it is a nicely finished dress and I love it. I’m tempted to sew all.the.caftans… and I do hear Charlie calling my name… can I resist? Do I really need another pattern? Fabric: Rayon from East Coast Fabrics, Brisbane. Purchased in 2016. Also see: there are sooooo many out there… just google Vogue 9253 or look up the #V9253 hashtag on instagram – enjoy! There was also a recent competition run by McCalls Patterns for this pattern. See all the winning entries here. When I saw the #sewphotohop challenge today I felt inspired to write up this blog post. This dress better than most answers that question… it’s the place where the worries of life slip away… a place of promise and potential… where problems can be solved and beautiful things await. It’s the place I lose myself. It’s the place where I also find myself again.